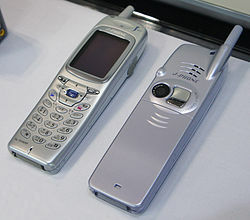 The J-SH04 was a mobile phone made by Sharp Corporation and released by J-Phone (SoftBank Mobile). It was only available in Japan, and was released in November 2000. It was Japan's first ever phone with a built-in camera (110,000-pixel CMOS) and color display (256-color display). (It has been asserted to be the world's first, but Samsung's SCH-V200 phone equipped with a VGA camera was released in South Korea several months earlier. ) The phone weights 74g, and its dimensions are 127 × 39 × 17 mm. It was succeeded by the J-SH05 flip phone, which was released just one month later. There is an alternative analysis of the history of the mobile camera phone that more tightly defines what a camera phone is  and confirms the place of the Sharp SH04 as the world's first mobile camera phone. The Samsung SCH-V200 camera was only half-integrated. It shared the same case and battery but was not integrated with the phone function. It certainly could not convey an image "at a distance" thus not conforming to the tighter definition of a camera phone. The image of the SCH-V200 had to be transferred to a PC. The Sharp SH04 was integrated both mechanically and electronically and could convey the captured image at a distance. It was the point of origin of today's mobile camera phones. ^ Debjit. "Sharp J-SH04: World's First Ever Phone With Integrated Camera". Digitizor Media & Web, Inc. Retrieved 26 August 2012. ^ "Samsung integrate digital camera and phone". Digital Photography Review. Retrieved 26 August 2012. ^ "First mobile videophone introduced (1999)". CNN. Retrieved 7 July 2014. ^ "Sharp J-SH04 – first to discover the consumer love affair with the camera phone (2001)". Stephen Temple. Retrieved 6 April 2013. Wikimedia Commons has media related to Sharp J-SH04. This page was last edited on 9 February 2019, at 20:12 (UTC).